Jupyter Notebook is a web application that allows you to create documents that contain code, outputs, and documentation. The code in Jupyter Notebooks can be re-executed to refresh outputs after you change a section of code. Jupyter Notebooks support many programming languages. See http://jupyter.org/. In previous versions of PlantCV, debugging image analysis workflows required running scripts with debug mode enabled so that intermediate output images would be created for each step. 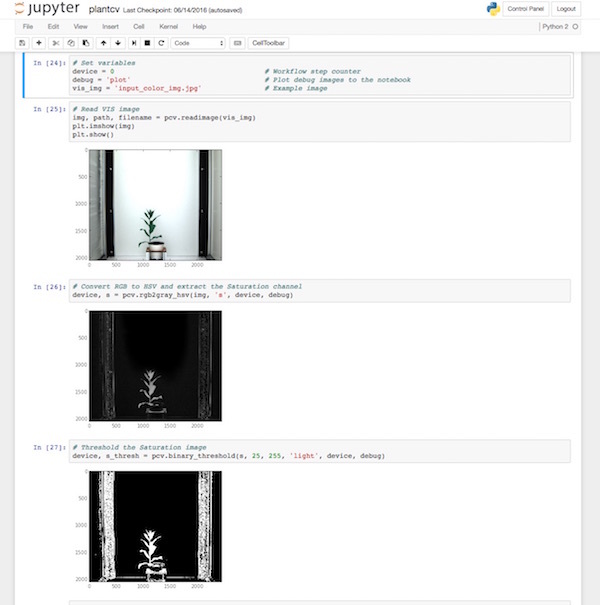 In the latest versions of PlantCV, analysis workflow scripts can be developed in Jupyter Notebooks so that the input and output images of each step in a workflow can be visualized instantly within the notebook. PlantCV is automatically set up to run in Jupyter Notebook but there are a couple of considerations. Third, PlantCV has a built-in debug mode that is set to None by default. Setting debug to "print" will cause PlantCV to print debug images to files, which is the original debug method. In Jupyter, setting debug to "plot" will cause PlantCV to plot debug images directly into the notebook. Not all of these imports are required, this is just to demonstrate that in addition to importing PlantCV you can import any other useful Python packages as well. The resulting Python script will be named notebook.py in the example above. Next, open the Python script with a text editor. Several modifications to the script are needed. Modify the list of imported packages as needed, but in particular, remove get_ipython().magic('matplotlib inline') and add import argparse. If PlantCV is importable in your normal shell environment, you can remove sys.path.append('/home/user/plantcv') also.